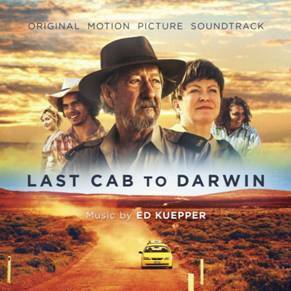 Following on from the film’s highly successful World Premiere launch at the 2015 Sydney Film Festival and ahead of its nationwide release this Thursday August 6th, Sony Music Entertainment Australia is pleased to announce that the official soundtrack to LAST CAB TO DARWIN will be available to purchase from today, Wednesday August 5th, 2015. LAST CAB TO DARWIN tells the story of Rex (Michael Caton), a cab driver who has never left Broken Hill. When he discovers he doesn’t have long to live, he decides to drive through the heart of the country to Darwin, where new euthanasia laws could enable him to control his fate. Unwilling to burden them or even talk about his condition, Rex leaves behind his best friend and lover Polly (Ningali Lawford-Wolf) and his crew of drinking buddies and sets off on a 3000km journey. “We recorded many elements before the film was actually shot,” explains Ed Kuepper who composed and performed all the tracks on the soundtrack. “I’d read the script and discussed the overall visual and emotional feel at length with director Jeremy Sims to get a basic idea of the musical area to work in. A road movie with a big heart, LAST CAB TO DARWIN entails a perfect balance of drama and humour, with this tender film uniting some of Australia’s finest actors in a story about life and love. Directed by Jeremy Sims and written by both Sims and Reg Crib, LAST CAB TO DARWIN features an all star cast of Michael Caton, Jacki Weaver, Mark Coles-Smith and Ningali Lawford-Wolf. On the soundtrack itself, all tracks – composed and performed by Ed Kuepper – contain snippets of narrative from the film. Actors included are Michael Caton, Mark Coles Smith, Jeremy Cumpston, Mercia Deane- Johns, Alan Dukes, David Field, Emma Hamilton, John Howard, Ningali Lawford-Wolf, Tom Pauling, Chris Stollery and Jacki Weaver. Ed Kuepper is an Australian guitarist, vocalist, songwriter and composer. He co-founded the punk band The Saints (1973–78), the experimental post-punk group Laughing Clowns (1979–85) and the grunge-like The Aints (1991–94). He has also recorded over a dozen albums as a solo artist. He has won Best Independent Release for his solo album Black Ticket Day at the ARIA Music Awards in 1993 and also won Best Independent Release for his solo album Serene Machine at the ARIA Music Awards in 1994.